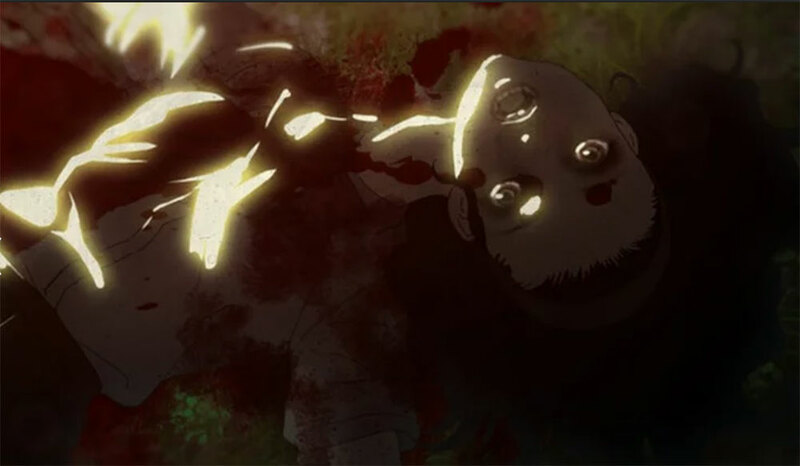 “Aragne: Sign of Vermillion” is an animated horror film from talented visionary Saku Sakamoto, making its world premiere at Fantasia 2018. 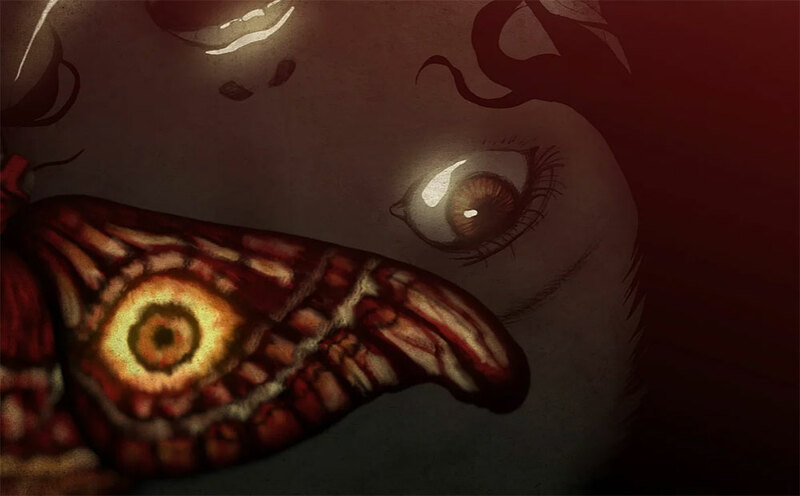 With elements of supernatural horror, creature feature, and grotesque body horror, there is a lot for genre fans to appreciate in this impressive slice of independent horror anime from Japan. The Fantasia International Film Festival is a tremendous platform for showcasing emerging talent and introducing fans to the films everyone will soon be talking about. But what I really love about the fest is its commitment to the weird and the experimental, to the films far off the beaten path —the beautifully strange hidden gems that would otherwise go undiscovered. 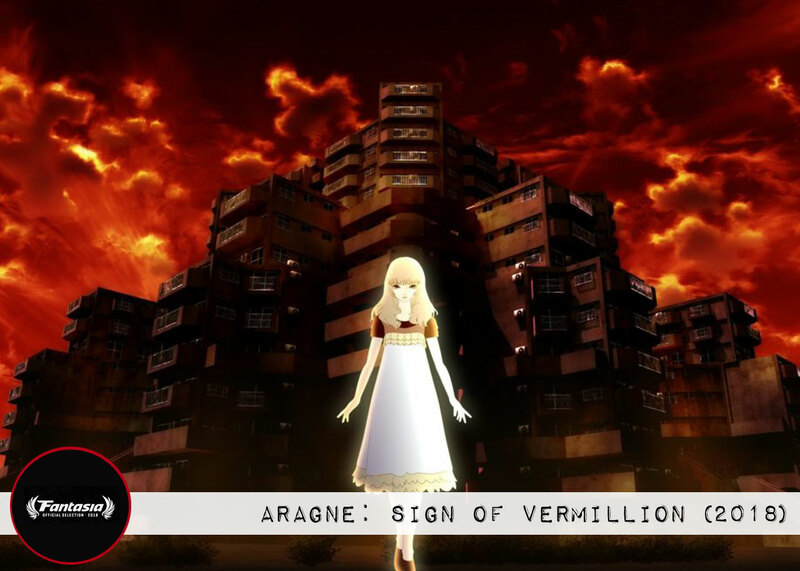 ARAGNE: Sign of Vermillion is one of those films, making its World Premiere at Fantasia 2018. 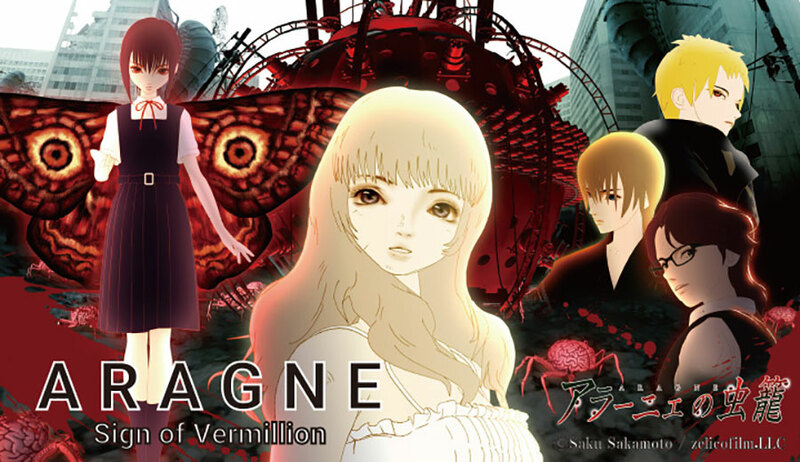 A full-length animated feature created by Japanese animator Saku Sakamoto, ARAGNE is more of an experience than a film. But what an interesting and unforgettable experience it was. While those expecting a conventional cinematic affair may be disappointed by the lack of cohesive narrative or discernible plot, ARAGNE offers something quite extraordinary for those willing to go along for its bizarre and hypnotic ride. The highly ambitious project required celebrated digital effects artist Sakomoto (Ghost in the Shell 2: Innocence) to wear five different hats during production: director, author, screenwriter, animator, and music producer. Known as the “transcendent painter,” Sakamoto’s work has been praised for his unique style and rich imagination — both of which are on full display in this film. 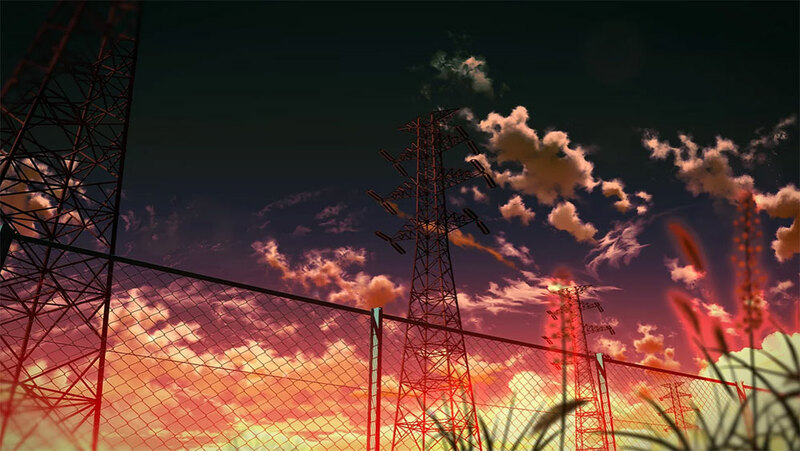 Most solo anime productions are short works of less than 30 minutes, and a full-length, 75-minute movie, particularly one of such high quality, is almost unheard of anywhere. 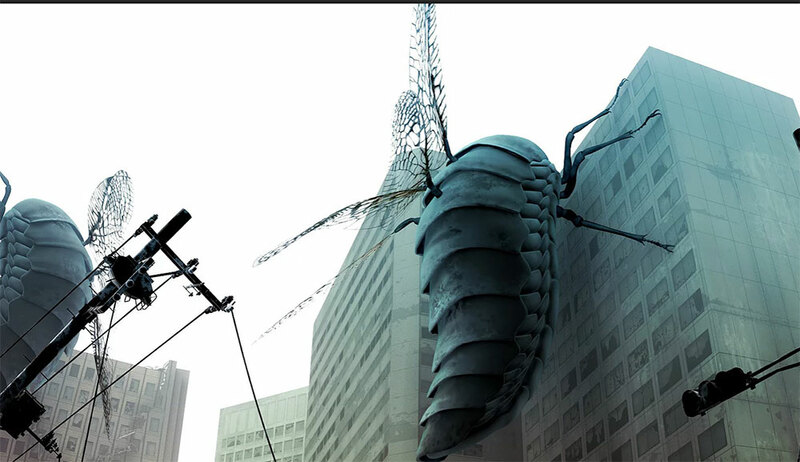 To create the creepy and foreboding atmosphere for the film, Sakamoto single handedly utilized 3D models for most of the building and background art, and then combined hand drawn images and 3DCG for the characters to create a complex scene. The result is a highly unique and dreamy visual style that is at times stunningly complex and mesmerizing, while at other times extremely crude and strikingly minimalistic. Much of the film feels like we’ve entered a dreamlike state, or that we may be viewing the action through the eyes of an unreliable narrator. It’s hard to tell what’s real or imagined. But that just adds to the disorienting and highly affecting nature of the film. ARAGNE tells the story of a young college student named Rin. She has just moved into a large and menacing apartment building on the outskirts of town, the site of an old factory. She’s disillusioned to discover the building is nothing like what she was promised when she signed the lease, sight unseen. Immediately upon her arrival, the area of the site is plagued by rumors of paranormal activity following the discovery of a female high school student’s corpse. Rin begins to experience strange things, including witnessing a large bug emerge from the arm of an elderly woman as she’s being transported to an ambulance. Curious about what may be happening, she looks for answers in the library. There she meets a folklore scholar who warns her about the many sightings of the strange bugs in the area. Referring to them as “spirit bugs,” he tells her the bugs may be harbingers of bad things to come. Similar to the myth of the Mothman as an omen of disaster, people often see the bugs right before dying a terrible and unnatural death. Terrified of the “curse of the bug,” Rin meets a mysterious and beautiful young girl, a shaman, and a serial killer — all while enduring terrifying encounters with the ominous bugs and other frightful occurrences. While ARAGNE is primarily a horror film, it contains strong elements of a mystery thriller — and I found myself riveted, trying to unravel the mystery of what was happening and why. To be honest, the conclusion to the mystery was not narratively satisfying, leaving me with far more questions than answers. It’s quite possible I was simply not able to connect all the dots effectively or fully stitch together all the disparate threads of the surreal storyline. Despite any real lack of clarity in the end, I truly enjoyed the journey. ARAGNE is as an effectively chilling and atmospheric nightmare. And like most nightmares, it doesn’t make much sense. But its haunting imagery and music will likely linger in your mind long after the film is over. I sense there is much below the surface of this film that I wasn’t able to fully grasp with just one viewing. Or maybe it’s that those deeper themes were not quite fleshed out enough to truly elevate this film to the status of a horror anime classic. However, in spite of my concerns over the story structure, I’d recommend this one to fans of dark animation seeking something refreshingly unique and engaging. 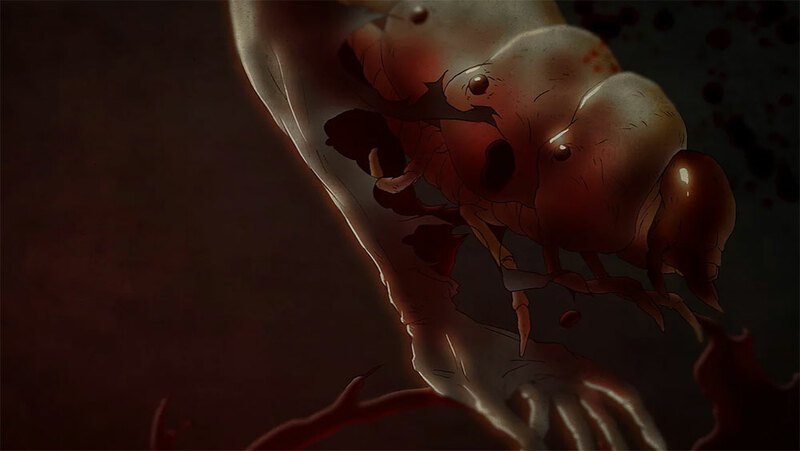 ARAGNE definitely delivers an interesting concept and some truly disturbing imagery and ideas you won’t soon forget.